While perusing real estate listings on Zillow, Redfin, or Trulia, you’ve probably encountered terms like “half bath” and “full bath,” or “1.25 bathrooms” and “1.50 bathrooms.” Or even 3/4 bathroom. What does it all mean? After a while it can all get rather complicated, especially when different terminology is used for the exact same situation. And no one really loves fractions. So let’s break it down, once and for all, to determine what it means and assess the value each type of bathroom can bring to a home. Let’s start at the top and work our way down. It’ll be easier to explain. For the record, the most common arrangement is two full bathrooms per home. Something like 60-70% of new homes are built with two bathrooms. The next most common setup is three bathrooms, followed by four and then finally one. In other words, it’s very rare for a new home to be built with just a single bathroom, for obvious reasons. A full bathroom contains four key items: a bathtub, a shower, a toilet, and a sink with running water. Simple enough, right? It can’t really be disputed. All four or it’s not a full bath, regardless of what the listing says. And believe me, the listing will often deviate from the truth. What’s surprising is how many bathrooms aren’t actually full bathrooms. Then we have the “three-quarter bathroom,” which consists of three of the four aforementioned items. So a three-quarter bathroom will typically have a stall shower (vertical upright), a toilet, and a sink. It’s missing the tub. The lack of a tub is probably the most common situation nowadays. 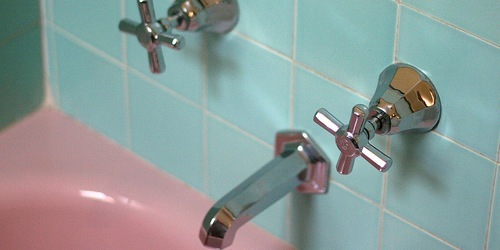 Some older homes may have a tub instead of a shower, but this setup is probably a lot less likely. Tip: Don’t get rid of a tub just because it’s not hip or aesthetically pleasing. It could affect the bathroom count and lower the value of your home (and cost money to remove it!). Although, I should mention that I’ve spoken with appraisers who don’t distinguish between 3/4 bath and full bath, so it may not even matter value-wise. If we remove both the shower and the tub, we end up with a “half bathroom.” This means in the case of the half bath there should be a room with a toilet and a sink (to wash your hands!). Typically, half bathrooms are found on the ground floor of a house where there aren’t any bedrooms nearby. My brother-in-law actually has one in his basement. It’s basically the guest bathroom, or the so-called “powder room” in many homes because you can’t do much else than apply makeup and do other unmentionable things. Again, things can get murky here if the room only contains a shower and a sink, or a toilet and a shower. But the norm is the toilet/sink combo. You can hardly call this is a bathroom, can you? Or a room for that matter. If anything, it’s really a teeny tiny room with just a toilet in it. It’s like an outhouse in the house. I guess you won’t be washing your hands after all…gross? However, a “quarter bathroom” may also be a room with just a shower in it. Again, these are rare. So bringing it all together, a house may be listed as 2.5 bath, 1.75 bath, or 1.5 bath, and so on. If this is the case, we just need to break it down. A 2.5 bath would mean two full bathrooms, and one half bathroom. A 1.75 bath would mean one full bathroom, and one three-quarter bathroom. A 1.5 bath would mean one full bathroom, and one half bathroom. And a 2.25 bath would be a full bathroom, a three-quarter bathroom, and a half bathroom. See how it gets complicated…it’s not algebra but it can get tricky after a while. Tip: It’s important to make sure the numbers of bathrooms actually match the description of the home listing. Don’t just take their word for it because oversights and “mistakes” do happen. What Value Does a Bathroom Add to a House? Okay, enough talking about the bathrooms. Let’s talk about the money involved. Or rather, the value they can provide to a home. While no two houses are the same, the National Association of Home Builders (NAHB) conducted a pretty robust study on this very issue back in 2006. They noted that a half bathroom adds roughly 10.5% to a home’s value, while a full bathroom adds about 20%. But they dug a bit deeper than that, breaking it down by bedroom-to-bathroom ratio. For a home with an equal number of bedrooms and bathrooms, an additional half bath would increase the value by roughly 10%, and a full bath would add 19% more value. And if the home has fewer bathrooms than bedrooms, the percentage gain can be even greater. For example, consider a two-bedroom house with only one bathroom. If you add a half bathroom, it will increase the value by 11.5%. Of course, the bathroom addition should make sense for the house layout to get maximum value. And just to be clear, by “add,” it’s not to say building a bathroom addition yourself. You probably won’t get the value back. We’re simply comparing homes with different numbers and types of bathrooms. In summary, be sure you recognize the value of a good bathroom folks! Most real estate agents call bathrooms “full” even when they’re not. Why is this not enforced! Yep, everyone rounds up regardless so not sure it matters much unless the buyer is really picky. I’m looking at a house that won’t budge in price- says 1.5 bath- the .5 bath is a toilet installed in a closet off the main dining room for a prior handicapped person. (JUST A TOILET). Yes I think some realtors need to get a grip on their descriptions… some are wonderful and some are down right deceitful !! Is there a sink in there? Sounds like a 1/4 bath if not. I have a quick question regarding these bathrooms that are a full bath. I have read above and it states that the full bath has all of the 4 amenities, i.e. : tub, shower (vertical), sink, and toilet. But, the 1/2 bath has only three of the these amenities. My master bedroom has a bathroom in it with just a Shower (Vertical Upright), 2 sinks, and toilet. Would that be considered as a Full Bath? Second, the bathroom on the first floor of my house has a Shower (Vertical Upright), 1 sink, and a toilet. Would that also be considered as a Full Bath? Last, the guest bathroom on the 2nd floor of my house has a Tub, 2 sinks, and a toilet. Would this be considered as a Full Bath? I just need some clarification because a few people has told us that the 2nd & 3rd bathrooms are only 1/2 bathrooms and that the master bathroom is a full bathroom because it’s in the master bedroom. Are all these correct? I’m totally confused. I need some clarification on this. None of those sound like full baths because none have BOTH a shower and a tub…as mentioned, you technically should have all four items in one bathroom to make it full. Whether it’s in a master or not shouldn’t matter to my knowledge. If there are only three items it’s technically 3/4 bath, though my guess is most people either call it 1/2 bath or round up to full bath. You don’t usually see real estate listings specify 3/4 bath.